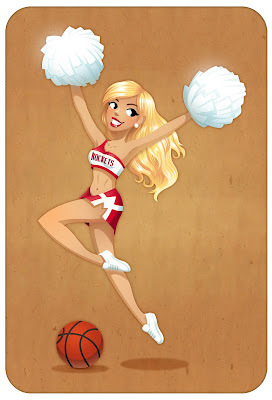 Tina Nawrocki - Art and Animation: Pinups - Morgan - Cheerleader for the Rockets! Pinups - Morgan - Cheerleader for the Rockets! Here is the STUNNING Morgan! What a beautiful, beautiful woman! She is a professional Cheerleader for the Houston Rockets, and wanted to have her pinup complete with pom-poms and basketball. This pinup basically drew itself! :D I was really honored to work with her!